Mom's Gone Bronson! 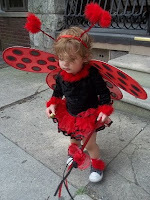 : Costume Supercenter Infant/Toddler Ladybug Halloween Costume Review! Costume Supercenter Infant/Toddler Ladybug Halloween Costume Review! Well, folks, it is that time of year again when summer starts to draw to a close and our attentions start to focus on the impending holiday season, which has always started for us with Halloween and ended with New Years Eve! And so, with that in mind, and with Halloween just around the corner, there has never a better time than the present to start the search for this year's costume. Usually, within our household, finding the perfect look is no simple feat! With two boys and a girl we are already looking in two different departments if we visit a store but, with the age difference being seven years between each child, we’re then looking at adult sizes for one, teens/tweens for the other and baby/toddler for the youngest of our brood! Throw in each child’s individuality on top of all that and we could be stuck all day walking around the mall picking out the right outfit - if we get any at all! However! This year is already off to a great start for at least one member of our bunch, thanks largely to online shopping, her good taste AND the vast array of outfits found by clicking here at: Costume Supercenter. At just a year and a half old our daughter knows exactly what she likes and what she wants and so instead of dragging her around the mall we checked out a few costumes online to see if there were any that caught her eye. After searching around the vast infant and toddler sections it really didn't take much time at all to spot something and for her to get terribly excited over a ladybug costume! As soon as we saw it we all knew right there and then that this was going to be “the one” for this year’s Halloween – and most probably every other event in-between that might require a costume! Once we had picked out the costume it took just TWO days for the package to arrive at our doorstep! Our daughter’s face lit up when we opened it together and the ladybug costume popped out! She couldn't contain her excitement and wanted to wear it right away and so, of course, we let her! Taking the costume out of the package I can tell you now that we were very pleasantly surprised with what we received! The outfit, made of thick velvet-like material comprises of an all-in-one leotard and tutu one pieace, which slips right on and does up at the back with Velcro. 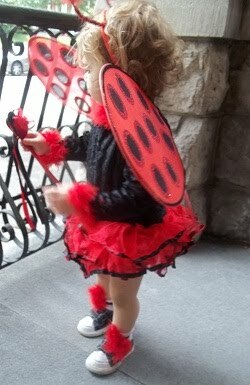 The outfit also comes complete with embellishments for the feet, a bobbly head band for antennas, a set of red and black polka dot wings AND a glamorous wand! The only thing we would have to provide, if desired, would be a pair of black tights - but seeing as it is still very warm outside, these were not necessary at this time! Looking as snug as a bug, beaming from ear to ear, our daughter waved hello to our neighbors as we went for a walk. She was so well recieved by everyone letting her know how cute she looked that she walked home incredibly proud and didn't want to get changed out of it for the rest of the afternoon. The material of the costume sat perfectly as she played and it didn’t weigh her down or make her itchy at all. The wings were large enough to look dazzling but not so big as to be uncomfortable and the little tutu just set off the whole piece, while the headband and wand finished the look! I have never been quite so thrilled about an outfit before and for the price you would pay you really do get a very good and well rounded amount of costume and service for the money, all from the comfort of your own home! No trapesing around stores, no stress, the process from start to finish is easy and corresponding with staff is never a chore. Costume Supercenter has a little something for everyone and a price to fit every budget too! With its wide range of outfits they really are able to please all of your toddler costume wants, needs, creativity and imagination, which is great when you just do not have the time to get down to the mall! Our daughter looked a picture in one of the cutest outfits I think i’ve ever seen and I would not hesitate to order more. The sizes are true to form, the descriptions are acurate and the prices are fabulous. Now all we have to do is to match our boys up with their outfits and Halloween, here we come!! ***Disclaimer – I was not compensated monitarily for this review, however, I was provided with an outfit of my choice, which is the one you see in the review. The opinions in this review are entirely my own and were not influenced in any way, shape or form by the provision of the costume. I will have to check them out! The outfit is adorable! She is SO cute and the outfit just makes her unavoidably cute!